If I'm not handing this straight round at a party or with coffee after dinner, I might keep half in my freezer, and put the other half in a box or two for Christmas presents. Make sure they stay cold, though. Place the chopped chocolate, condensed milk, butter and salt into a heavy-based pan over a low heat and stir until melted and well combined. Place the nuts into a freezer bag and bash them with a rolling pin, until broken up into some large and some small pieces. Add the nuts to the melted chocolate mixture and stir well. Pour the mixture into a 23cm/9in square tray, smoothing the top with a wet palette knife. Let the fudge cool, then refrigerate until set. Cut into small pieces approximately 3cm x 2cm/1¼in x ¾in. Cutting 7 x 7 lines in the tin to give 64 pieces best achieves this. 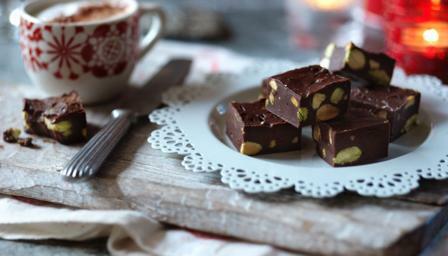 Once cut, the fudge can be kept in the freezer - there's no need to thaw, just eat straight away.